The flat is not complete flat. This stainless steel rack should be hand washed with a non-abrasive cleaner. 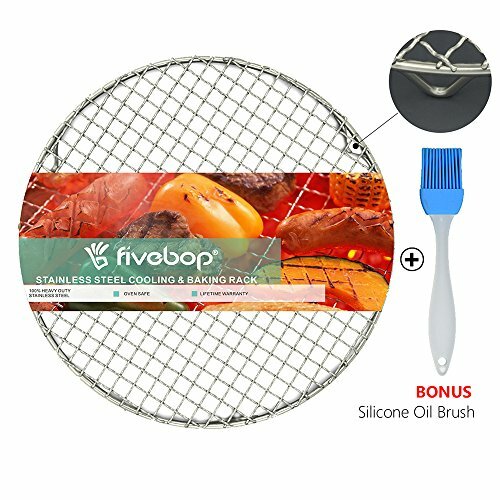 Made from heavy weight and high quality 304 stainless steel, cross-wire net also suitable for BBQ. Dome design make the oil drop faster. Footed base for added stability; great workspace for finishing foods, like decorating cookies, cupcakes, and more. Feet high : 1 inch .Size: Diameter:11 inches/28cm,Diameter: 13 inches/33cm. Diameter:13.7 inches/35cm,Diameter: 17.7 inches/45cm. If you have any questions about this product by Fivebop, contact us by completing and submitting the form below. If you are looking for a specif part number, please include it with your message.